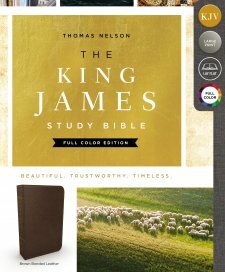 The King James Study Bible from Thomas Nelson contains a lot of useful information in helping people to understand the Bible better. A Bible book description and outline is included before the books of the Bible start. There are also tidbits of information included along various parts of the Bible text which sometimes include photos and pictures. Maps are also included near the Bible text that explain certain routes people in the Bible took during the Scriptures they are around. There are notes about different parts of Scripture at the bottom of the pages which also give important words in bold. Scripture passages are listed in the middle of the pages that the Scripture can be cross-referenced with. There are also some digging deeper tidbits that are included which help people to learn the deeper meanings of the Scripture it explains. The words of Jesus (Yeshua) are in red, which helps people to understand the parts of the Bible where he speaks. There are colored maps in the back of the Bible as well. This Study Bible includes some features that I don't remember seeing in other Bibles I have reviewed such as the Jewish Calendar which explains the Hebrew days of the month, number of days in each month, month order of civil year, and month order of sacred year, a chart listing Messianic Prophecies, and a Topical Index to End Times Prophecy. I read through the Bible books of Habakkuk and Zephaniah while reviewing this Bible. I liked that the notes at the bottom of the Scripture pages helped me to understand better what I was reading and gave me some Hebrew meanings. There were more thou, hath, and ye's in this Bible translation than I am used to reading but I got used to them after awhile and I didn't notice them so much. I like that the Bible book descriptions use different subjects in their descriptions, such as the book of Judges explains the historical setting, and authorship (I noticed that most of the Old Testament introductions include these subjects) and the book of Acts explains the theme, authorship, date, purpose, and application (I noticed most New Testament introductions contain different subjects). I also liked that some Hebrew definitions were given throughout the first couple of chapters of Genesis and included in the notes at the bottom of the Scripture pages and that the Concordance includes some Hebrew words for the English words. This is another Bible I am considering tabbing with Bible book pages, which tells me that I might use it a lot. It is definitely filled with much useful information in helping me to understand what I am reading in the Bible better. Disclosure of Material Connection: I received this Specialty Bible free from the publisher through the BookLook Bloggers book review bloggers program. I was not required to write a positive review. The opinions I have expressed are my own.